Claims of LEGO responsible corporate stewardship in response to climate change, range from expanding renewable energy-supported manufacturing to mandating Forest Stewardship Council (FSC) packaging material sourcing. In the case of its interlocking plastic building brick raw materials, an increased use of reground, recycled product plastic coupled with speeding-up the search for sustainable material substitutes that does not compromise the safety or play experience quality, lead corporate efforts to reduce its reliance on oil-based raw materials. While LEGO began making its famed interlocking building brick in 1949, it was redesigned and patented in 1958, when LEGO first began brand marketing of the toy as an outlet for creativity and educational play. By the late 1960s Shell, like other multinational oil majors that realized its golden era of research and global oil exploration and development expansion, began co-brand marketing with LEGO at a time when the toy maker was selling about 19 million set worldwide, each year. By 2014 however, LEGO’s concept of sustainable environmental earth stewardship and non-controversial association with Big Oil, had reached a disconnect, especially in the US where saturated news coverage of the 2010 BP Deepwater Horizon oil spill has been revisited due to environmental concerns with Artic drilling. It’s a disconnect LEGO management would have been wise to have detected earlier than its exposure last year, by Greenpeace. 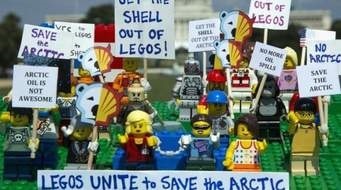 At a minimum given the importance of Shell’s worldwide distribution channels on LEGO revenues, a corporate crisis management plan should have been in place due to LEGO’s co-promotional exposure from Shell’s Alaskan Artic operations could pose, in generating negative headlines. LEGO reluctantly reacted to the risk in October 2014, after pressure from a viral Greenpeace LEGO-themed YouTube video campaign that garnered 4.5 million views in its first week. The 90 second video, set to The Lego Movie theme song “Everything is Awesome” shows the effect of a major oil spill disaster on LEGO-land Alaskan Indigenous people and wildlife. Because of its high-quality digital video production and brand notoriety, the video garnered emerging media rebroadcast by marketing and advertising communities in addition to business and general media outlets. For example, the video was last linked to LEGO’s official Twitter feed on October 28, 2015 and has dominated its Twitter activity for the past year. Greenpeace’s online petition has garnered 750,000 signatures while direct consumer-to-LEGO contact has been reported to have brought individual consumer-level feedback in support of the Artic protection that exceeded 1 million people worldwide. In mid-October 2014, LEGO announced that it had terminated its 2011 contract renewal with Shell for co-promotion purposes, at the end of this agreement’s term, which remained undisclosed. LEGO Group CEO Jorgen Vig Knudstorp commented the agreement termination and the protest campaign, “We do not agree with the tactics used by Greenpeace that may have created misunderstandings among our stakeholders about the way we operate; and we want to ensure that our attention is not diverted from our commitment to delivering creative and inspiring play experiences.” Whether the misunderstanding actually stems from Greenpeace or LEGO’s own association with non-toy maker corporate interests, emerging media’s ability to garner significant grass-root consumer discontent, should serve as a warning to brand managers that co-promotion marketing should be undertaken with caution and prudent crisis management planning. What do you think, should brand managers more cautiously enter into co-promotion opportunities due to the influence of emerging media-centered consumer protest campaigns? Tell me about it in the comments below. 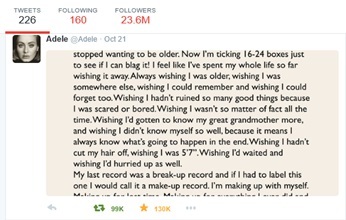 Within 24 hours, Adele retweeted actor/filmmaker Xavier Dolan’s Tweeted link, for his Billboard interview discussing his collaboration with Adele on her new album “25’s” cover song, “Hello.” Before hearing the first chord of music, before seeing one image, I learned that the video had been filmed in Quebec and Toronto. That Dolan was scared at their first meeting, wondering whether he would be inspired by the song enough at that human level, necessary to fuel his artistic passion. That while hearing the song for the first time, he wanted to buy the fabric himself, for the coat he envisioned she would wear in in the video, set at an old country home. Despite physically being a “million miles apart” from the British Adele and Canadian Xavier, I had heard each during what felt was a personal encounter, as each expressed their simple and heart-felt impulses behind “Hello’s” artistic expression. With my simple click of the article’s embedded Vevo video, “Hello” officially launched in Bridgeport, WV. The first music video to be shot with an IMAX camera, “Hello” delivers spectacularly in its black and white cinematography, musical artistic expression and universal human-relatedness surviving life’s regrets and heartache. Though a clear landline connection earlier that week, I answered “Hello?” initially, to a call-back from a nearby neighbor I had never met. That morning, a tired, limping and thin cat followed my English cocker spaniel Spirits and I for a few minutes as we walked, before lagging behind to rest alongside a neighborhood residential driveway. 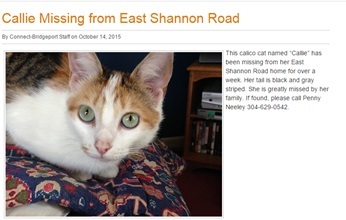 I had been alerted by a tweet from Bridgeport Connect, a web-based local media outlet, that “Callie,” a Calico cat that lived a few streets from me, had been reported missing for over a week. Unsure if the cat we encountered was actually Callie, I gave missing cat owner Patty during her call-back, the details of our encounter with the very tired and some-what injured cat. Although that cat turned out not to be Callie, Patty’s family member did make it safely home a few days later, on her own. Especially on a mobile platform, Twitter has the ability to provide focused but unencumbered personal connections that span both the miles between continents and footsteps within neighborhoods. Twitter has been my personal technology portal-of-choice linking my traditional newspaper and TV habits to the World Wide Web and other emerging media platforms like Facebook, YouTube, and Instagram. I’m generally a passive Twitter user (unless you count retweets) who follows national, state and local media newswires and outlets, local government activities, favorite comedy programs and their cast members, as well as Christian, Earth knowledge and lifestyle inspirational resources that help me navigate day-to-day with an informed and hopeful outlook. Twitter keeps me informed, but not encumbered by, what I need to know right now. It’s a good complementary mobile technology to smart phone texting with friends and family. The Focus | Fringe of Beverly Hills has asked for a fictional branding video for its salon hair care services and hair care products that will be used on its company website, YouTube, and client social media accounts. The Audience | Client demographics include men and women ages 25+, households $100K+ who are business executives, celebrities, independently wealthy, entertainment industry and other Beverly Hills professionals. Client psychographics are to develop style-confidence which is in harmony with the best of who they are by overcoming a physical image problem or through emulating latest style trends and celebrity looks. the brand’s delivery of camera-ready artisan style that blends sophistication and luxury with casual ease and down-to-earth comfort. The Brand | For those Simple Celebrity moments when life conveys that you are most treasured, Fringe salon services of hair styling, color, hair extensions, make-up and keratin blow-outs and its salon-quality hair care products deliver style-confidence that allows you to look your very best. The Creative Approach | In this branding video for the Fringe salon website and social media, we see a relaxed, happy and style-confident Fringe customer, a Beverly Hills MD and Mother who has taken the day off from work, as she leaves the salon and walks down the Beverly Hills sidewalk, after styling (including color and extensions). The background music carries a hint of Fringe’s Parisian-décor, with brief accordion passages in its moderate-tempo cool jazz score. As emotional moments transpire during this Mother-Son serendipitous kite flying experience, we hear the sound of a camera shutter as each special Moment is captured in her heart. As she walks toward her car with a bright smile, bounding gate and brush of her hair, the Mother envisions her 6 year-old Son’s surprised expression when he finds her waiting after school, at his bus stop. We see her Son’s sad expression as he rides in his school bus tired and dejected, after a long and frustrating school day. As he steps off the bus, we see his expression transformed by his Mom’s voice. He races to greet her with a surprised smile and strong embrace. Her initial concern changes to gratitude and self-assurance in realizing how her presence helped transform his mood. In a spur-of-the-Moment decision, she suggests they visit a nearby kite store and travel to their favorite hiking area at the Wilderness Gardens Preserve in Pauma Valley, CA to launch the kite’s first flight. At the store, the store owner helps them find the perfect colorful kite her Son has always imagined flying. At the Wilderness Preserve, we see the Mother and Son prepare the kite and string setup and begin running together to help the kite catch the breeze and begin its flight. From above, we see the kite gain altitude as the string extends from the pair’s control. We see the Mother and Son jump in joy and dance, at their flight success. In front of a colorful background of local flowers, we see Mother and Son land the kite as they laugh, high five and embrace one another. The last image of Fringe’s radiant Mom shows Mom and Son, enjoying ice cream as they stroll the sidewalk beside the Fringe Salon, as salon owner Lindsey Carse styles another customer’s hair. Lindsey stops briefly to move to the storefront window and share the joyful afternoon with Mother and Son. The spot fades to blackout, with the Fringe of Beverly Hills name and tagline “Simple Celebrity” as this spot closes. 1. (MS) From the Fringe salon interior, over salon owner’s Lindsey Carse’s right shoulder, Mom smiles as she touches her long-full hair that accents her enthusiasm, as she waves good-by. 3. (MS) Mom’s Son sadly exits the bus, quiet and looking down at his feet. 4. (WS) Son runs and jumps into his Mother’s arms, as she dances for a few seconds with him, in comfort. She puts him down, keels to his level (CU) and brushes back his hair to look intently into his eyes to make sure he is alright. (CU) His transformed happy expression allows them both to be overjoyed in each other’s presence. (WS) From behind-right, Mom (with her long hair swaying) and Son hand-in-hand march purposefully on this perfect warm and breezy kite-flying day, toward their car, parked along the sidewalk. (Music 1:30) VO: BEING TREASURED …BY ONE. 5. (MS) From inside a well-stocked colorful kite store, the owner reaches for the Son’s kite selection displayed overhead, handing it to the excited boy. (MS) From over the owner’s right shoulder, his Mom brushes her hair over her shoulder as she mimics her Son’s excitement over having gotten the large, colorful kite he had dreamed of, then looks up toward the owner. 6. (MS) From a low ground-level view, Mom Holds the kite and Son (controlling the string winder reel with a few feet of string extended) They begin running together as the kite catches the wind. (MS) Both the kite and the Mother’s hair (in slow-motion) wave briefly back-and forth. Catching the wind (in normal motion), the kite launches to 25 feet above them. 7. (WS) From an elevated camera advantage, Mother and Son stop, as the Son begins to unwind more string, allowing the kite to climb in altitude toward the camera. 9. (WS) From slightly behind-right, Mom (with her long hair swaying) and Son hand-in-hand walking slowly along the sidewalk in front of the Fringe salon, licking ice cream cones while holding the kite held-high. Working on a customer sitting in the street-side chair, Lindsey sees them and waves, as she walks closer to the salon’s window store front. The three smile, laugh and dance-in-place together. The camera pans to Lindsey’s face (CU) before closing on the storefront Fringe name, then blackout. Creative Approach: In this branding video for the Fringe salon website and social media, we see a relaxed, happy and style-confident Fringe customer, a Beverly Hills MD and Mother who has taken the day off from work, as she leaves the salon and walks down the Beverly Hills sidewalk, after styling (including color and extensions). The background music carries a hint of Fringe’s Parisian-décor, with brief accordion passages in its moderate-tempo cool jazz score. As emotional Moments transpire during this Mother-Son serendipitous kite flying experience, we hear the sound of a camera shutter as each special Moment is captured in her heart. As she walks toward her car with a bright smile, bounding gate and brush of her hair, the Mother envisions her 6 year-old Son’s surprised expression when he finds her waiting after school, at his bus stop. We see her Son’s sad expression as he rides in his school bus tired and dejected, after a long and frustrating school day. As he steps off the bus, we see his expression transformed by his Mom’s voice. He races to greet her with a surprised smile and strong embrace. Her initial concern changes to gratitude and self-assurance in realizing how her presence helped transform his mood. In a spur-of-the-Moment decision, she suggests they visit a nearby kite store and travel to their favorite hiking area at the Wilderness Gardens Preserve in Pauma Valley, CA to launch the kite’s first flight. At the store, the store owner helps them find the perfect colorful kite her Son has always imagined flying. At the Wilderness Preserve, we see the Mother and Son prepare the kite and string setup and begin running together to help the kite catch the breeze and begin its flight. From above, we see the kite gain altitude as the string extends from the pair’s control. We see the Mother and Son jump in joy and dance, at their flight success. In front of a colorful background of local flowers, we see Mother and Son land the kite as they laugh, high five and embrace one another. The last image of Fringe’s radiant Mom before leaving the preserve area with her Son, is captured into an image that becomes the cover of a Vogue-like magazine titled “Fringe of Beverly Hills” that carries a story headline, “Simple Celebrity” as this spot closes. 1. (MS) From the Fringe salon interior, over salon owner’s Lindsey Carse’s shoulder, we see Mom smiling as she touches her long-full hair that accents her enthusiasm, as she waves good-by. 3. (MS) Mom’s Son sadly exits the bus, quiet and looking down at his feet. (CU) From his Mom’s perspective, we see his head rise as he hears her voice, his whole body and facial expression transforms into joyful surprise. 4. (WS) Son runs and jumps into his Mother’s arms, as she dances for a few seconds with him, in comfort. She puts him down, keels to his level (CU) and we see her brush back his hair to look intently into his eyes to make sure he is alright. (CU) His transformed happy expression allows them both to be overjoyed in each other’s presence. (WS) From behind-right, we see Mom (with her long hair swaying) and Son hand-in-hand march purposefully on this perfect warm and breezy kite-flying day, toward their car, parked along the sidewalk. (Music 1:28) VO: It’s as simple as (Music 1:32) One who knows your Love. 6. (MS) From a low ground-level view, Mom holding the kite and Son (controlling the string winder reel with a few feet of string extended) They begin running together as the kite catches the wind. (Music 1:45) VO: Indigenous with your soul. 8. With a colorful floral background, we see the Mom holding the landed kite above her Son’s head, as the Son re-winds the final length of string into the winder reel. Both face the camera, to pose smiling, for their kite-flying portrait. In this junior Army officer training, we see Captain Y and Captain Z walking through a military training location, as they discuss the importance for Army leadership to be motivated to ensure their units are properly trained, equipped and supported for both professional and family-related needs. As Captain Y explains that he feels a personal responsibility to each soldier to ensure they have the basic necessities that makes them effective soldiers, Captain Y and Captain Z are shown working with their units to direct supplies and equipment distribution to team members. As we see b-roll footage of unit members working with each other during a training exercise, we learn that unit members facing problems can hurt unit effectiveness and morale and that’s it’s a leadership responsibility to help soldiers overcome the natural tendency for soldiers to feel reluctant to ask for help. As Captain Z is shown talking to one of his unit members who has asked for help, we find unit members who use support services, are more strongly bond to the Army and its culture to “leave no man behind.” We learn this culture applies not only to job duties but also unit member family needs, such as the special care needed for a young child who battles a cancer diagnosis. We learn the importance of family support for each soldier, but also that the Army itself lives out its own family commitment to each other. Motivation is — it’s probably stronger than money when it comes to our unit and the success of our unit. And that motivation is also key to — to the spirit of the unit. You — it — you have to be motivated. We actually, as Commanders, live for our soldiers as — as we do our own families. If one of my soldiers is hurt, it’s — it’s more than personal because if they — if they’re without, then I feel like it’s — it’s — it’s my fault or my First Sergeant, he feels the same way. So we have to ensure that they have the basic necessities to keep them healthy, and that’s where it starts, with motivation. I’ve never seen a unit come together more than when a soldier or a soldier’s family needs help, and it – like CPT Y was talking about motivation, it’s a great motivator to know that you’re helping one of your soldiers. Soldiers are the — are the heartbeat; that — they’re the pulse and they’re the tempo of that unit. And if that — that tends to skip a beat or tend to catch asthma, it’s going to show. And — and that– keeping that team healthy is — is most important. If one soldier is hurting, his friends are going to know about it. His friends are going to suffer from it. It’s going to bring down morale. I think that’s part of the Army mentality; that you don’t want to ask for help. And I think, as Commanders, I think it’s important that we recognize those soldiers that need help and try to break that barrier and let them know it’s okay to come forward and — and ask for the help that the Army can provide them. I mean, once they receive help and once you’re able to help, you know, not only you want — you want to help someone else, but at the same time, that soldier is going to be willing to — to dedicate himself more to the Army. That culture is one that it spreads and is — is — you’ll never read about it. You’ll never see it. There’s — there’s no science to it; it’s just a culture that once you put this uniform on, that you’re part of a family. And it’s a grand scheme of taking care of each other, leaving no man behind and that your part is — your small part of the Army is taking care of your family. And that saying, leave no man behind, it doesn’t just refer to when you’re on the battlefield. It refers to just as much when you’re back here at home station and your soldier needs help. You — you just don’t leave him out there on his own. You — you bring him in and you take care of him. So you ask how — how do we do it. Well, we have the support of our family at home, but our unit is a family. And when one of them is in trouble, we all come to their aid. And that’s how — that’s how we make sure everybody is taken care of. In this cable TV spot, we join a father as he takes preoccupied and indifferent son on a journey over a latticed road bridge to a pine tree forest, where they find a magical snow-covered winter farm tended by a long-bearded, stout farmer. While the son begins self-absorbed in his music to his father’s dismay, a close encounter with a magnificent male reindeer who flies, transforms the journey become a special father-son bonding time. With his Son’s child-like amazement and new enthusiasm, the father heads home pleased he has passed down this magic experience and place he once relished with his own father, long ago. SO YOUR MOM AND I THOUGHT YOU MIGHT LIKE THIS. 4. (CU) Son with his eyes closed, absorbed in his music not hearing any of his Dad’s words. In this network and cable TV spot, we join Flo as she gathers with her family to enjoy conversation during their evening ham holiday meal. A series of introductory shots, showing pairs of family members, allows the audience to see bored Janice, defensive Todd and perky get-along Flo, respond to Diane’s conversation-starter asking Janice about her recent work accomplishments. Interjected between the siblings antagonistic then smooth-over dialog shown through rapid cut backs, the entire family joins the conversation as Dad joins in to add his dinner-related comments while Grandpa shares his relationship wisdom. In an effort to showcase Flo’s famous likeability over her normal, but dysfunctional family members who ultimately want Flo can her perky work chatter, Stephanie Courtney, who plays Flo in all Progressive Flo commercials, played the part of all family members Janice, Todd, Diane, Dad and Grandpa. 1. (WS) Flo’s family (from left, Janice, Grandpa (back), Todd with sleeping baby (back), Diane, Dad, and Flo) are seated around a dining room evening ham holiday meal. No one is shown eating or drinking during the spot. The sound of family members tapping or scraping china dishes with their silverware can be heard throughout the spot. THEY WERE ASKING ME WHAT YOU’RE DOING NOW JANICE. YOUR BLOG IS JUST PICTURES OF YOU IN A MIRROR. IT’S CALLED A FASHION BLOG TODD. 6. (MS) Janice holding smart phone listens as Flo (looking left and then right toward other family members) interjects her latest accomplishments to interrupt the growing tension between Todd and Janice. I GOT A DISCOUNT ON THIS HAM. I’VE GOT THE MEAT SWEATS. THIS IS A GOOD HAM, DIANE! GIVE IT A REST FLO. YEAH, GIVE IT A REST FLO. the brand’s delivery of camera-ready aesthetic style that blends sophistication and luxury with casual ease and down-to-earth comfort. The Brand | For those Simple Celebrity moments when life conveys that you are most treasured, Fringe salon services of hair styling, color, hair extensions, make-up and keratin blow outs and its salon-quality hair care products deliver style-confidence that allows you to look your very best. The Focus | Stonegate Mortgage has asked for a fictional branding video to launch its Stonegate Direct online retail mortgage origination services division so that the initial audience brand exposure helps establish a human emotional connection as a caring and trusted mortgage partner. This introductory “teaser” video will be part of a national direct-to-consumer mortgage market brand awareness campaign that will introduce satisfied customer-testimonials and content-driven product commercials. Videos will be used in full-format for the corporate website, YouTube, and client social media accounts while short-format versions will be used in US nationwide network and cable TV commercials. Married with kids: HH income $98K, single family dwelling to be purchased, age 37 (female decision-maker), buying for larger living space and desire to own a home. Multi-Generational Housing: HH income $86K, single family dwelling to be purchased, age 50, buying for desire to own a home. Primary new home owner psychographics include the desire to own a good place sufficiently large enough to raise children as well as the need to provide the family a place where it feels safe and has design control of its living space. Ethos of hard-working, resourceful multi-ethnic cultural fabric of family, friend and community connections. New home owners such as Hispanic multi-generational households, as well as low-income (FHA-backed), US Armed Services (VA-backed) and USDA-backed rural families, in additional to conventional middle-income or upper-income households. Home Improvement Loan (HIP) program allows new homeowners renovate floors, windows and paining to reflect their unique needs and cultural design. The Brand | Stonegate Direct’s caring and trusted mortgage advisors whose mortgage experience, obsessive attention to details that matter most to your on-time closing success and set-in-stone commitment to be present at your closing table, makes Stonegate Direct your 24/7 Closing-in On Home partner that understands the pride you take in establishing your family’s home ground where they find the security to live life, their way.